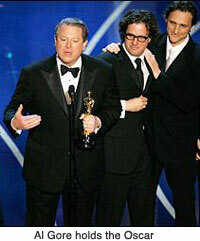 Al Gore's Inconvenient Truth won the Oscar for best documentary last week in Hollywood. 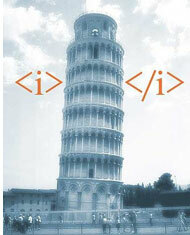 Needless to say, this made the people behind the design of Al Gore's Keynote slides — Duarte Design — very happy indeed. "We are beside ourselves here," said Nancy Duarte, co-founder and principal of Duarte Design. Duarte Design began working with Al Gore in 2003 to build the presentation used for his talks on climate change given around the world, and later for "An Inconvenient Truth," which also won an Academy Award for Melissa Etheridge's "I Need To Wake Up," (see her music video on YouTube) the winner in "Best Achievement in Music Written for Motion Pictures, Original Song." (The Inconvenient Truth DVD. The Book). 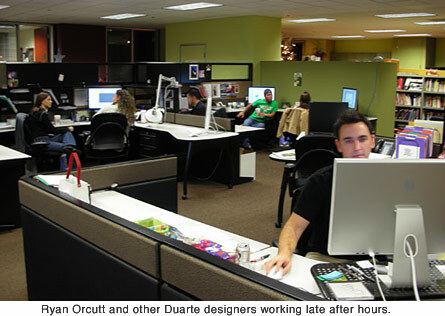 Duarte Design, founded in 1988, is unique in its presentation-design focus. The design firm, which has more than 60 employees, is able to cultivate an objective vantage point that helps their clients "uncover hidden value in their messages." Duarte calls this “making the invisible visible.” Experience and subject matter expertise are, of course, indispensable the designers at Duarte say, but sometimes this can actually block the formation of fresh perspectives. A new point of view usually arises, they say, from an unconscious shift in perception when the elements of the problem morph into the solution. "These insights are uniquely human and very personal," says Nancy. The Duarte approach is for their designers and messaging strategists to understand and facilitate these unconscious shifts, to not only create powerful stories and aesthetics for their clients, but to manage them in such a way that allows their audience members to form individual insights. "Ultimately, that’s what makes communication the stickiest, allowing the recipient to experience epiphanies without being spoon fed," Nancy Said. We are often so close to our issue (a product or research question, etc.) that we can not see the forest for the trees. This is where designers with open minds and open ears (and talent) can make a difference. But remember that design is not about decoration or making things pretty. Designers do not decorate, they make things clear, and they help the creator of the story make meaning. In my visits to the Duarte office in Silicon Valley, I have always been impressed with the creative spirit and energy of the place. Their approach really seems to embrace the six aptitudes outlined in Dan Pink's A Whole New Mind (one of my favorite books): Design, Story, Symphony, Empathy, Play, and Meaning. These are aptitudes which are paramount in today's world. If a presentation is critically important, it is not just about giving information. More often than not it is a call to action (buy something, do something, change something, create something, etc.). And a call to action is as much about emotion as it is about logic and argument. Design, in the context of storytelling, helps to illuminate. Designers in this sense, then, are "illuminators" of a sort. Nancy Duarte says that they are disciplined about harnessing the emotional value of visual grammar as well, orchestrating the aesthetic experience through well-known, but often neglected design practices such as grouping, isolation, and symmetry, etc. "It’s both art and science — and we’re seriously creative." When I visited the Duarte Design offices in December, Ryan Orcutt, one of their young designers, had just returned from helping Al Gore with his live TV appearance on the Oprah Winfrey Show on the other side of the country. 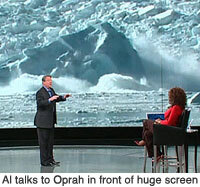 Ryan said he was sent out on just a moments notice to the show to assist Al Gore in making edits or changes to his presentation before the show and also to assist the Oprah Show graphic designers in adapting the Keynote file into a new aspect ratio for the incredibly enormous screen on the set. The images where coming right from Keynote, in fact right from the MacBook Pro that was on stage with Al. Ryan said the Oprah graphics department did a great job adjusting images and movies so that they "looked amazing" on the screen and also on people's television sets. "It's been a very rewarding experience to work with Mr. Gore and his team," Ryan told me. "It's not often that you feel like the work you do is benefiting the world and it's been a real privilege to have that be a part of my job." These slides were likely never projected on a screen. 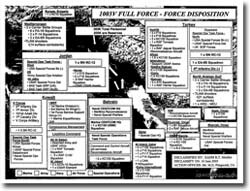 PowerPoint decks like this are instead often printed and used in the US government and military as a kind of document. (See earlier posts related to slideumentation here, here, and here). Slides like these would not make for good visuals, but they do not make for good documents either. Even though the title of the slide (err, "page") below is "Key Planning Assumptions," the problem with presenting bullets like this is that important assumptions about each bullet point are left unstated and unexplained. Since printed slides like these are acting as de facto documents to be left behind and examined later, why not present the information with more written explanation and greater clarity in a properly written document which adheres to the principles of good writing and good document design? Is the last bullet the most or least important? In a document like the one above, what is the relationship of the bullets? Is it sequential from the first to the last in order? Or is it priority from the most important to the least important? (Or the other way around?) Or is it that the bullets are just related in some way. When most people look at such a long bullet list like the one above it's only natural to assume (whether consciously or not) that the last bullet may be of lesser importance than items higher up on list. In this case the last item, "Iraq regime has WMD capability," looks almost as if it were a parenthetical addition following the two-line acronym-filled bullet (number nine out of ten if you're counting) on "forces in Turkey" placed above it. WMDs, of course, would apparently move up the bulleted-list chain on future PowerPoint decks in Washington. In the Cognitive Style of PowerPoint, Edward Tufte, citing the 1998 Harvard Business Review article ("Strategic Stories: How 3M is Reviewing Business Planning"), suggests that bulleted lists "can make us stupid" because bullet lists (1) are too generic, (2) they leave important relationships unspecified, and (3) key assumptions are left vague at best. These briefing slides seem like pretty good examples of the kind of "documents" we should avoid subjecting our audiences to. Above: POTUS = President of the United States. SECDEF = Secretary of Defense. The first bullet reads much differently if it is written "George Bush/Donald Rumsfeld directed effort; limited to a very small group." I am not arguing with the content of the briefing slides, there are plenty of sites for that. I am saying that the way in which it was presented is something that we ourselves should avoid doing at all cost. Presenting paper documents like this — which violate rule after rule of good document design and good writing — will obfuscate our message, not clarify it. You will need this: List of acronyms used in War Planning Slides (PDF). Thanks to my buddy Les in Australia for the heads up on these slides. I am a huge fan of TED and truly appreciate their efforts to share their presentations with the rest of the world. Here are a couple of very short TED presentations (only three minutes each) which you will enjoy. Both have good content, a simple and important message, and each presenter uses visuals that evoke emotions. The presentations are not perfect; I think you could offer up several tips to each of these brilliant men that would help them the next time they do a short presentation with visuals. Still, the short presentations provide another chance to learn. 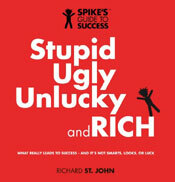 Let's look first at the presentation by Richard St. John, author of Stupid, Ugly, Unlucky and Rich: Spike's Guide to Success. (The title of chapter one of the book is "My Apologies for the Title). Watch the video below or here on the TED site. Richard St. John: Why do people succeed? Richard St. John's visuals complemented his talk pretty well. The simple graphics are the same ones used in his book. The playful nature of his visuals and his delivery are consistent with the look and feel of his book as well. The single biggest thing that would have improved his presentation is the use of a small remote so that he could keep his eyes on the audience and his hands and eyes off his PowerBook. The addition of a remote is a simple thing, yet it is the one change that makes a huge difference in one's ability to free themselves from the PC and the podium and connect with the audience. 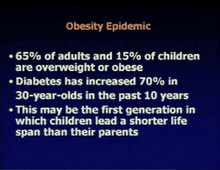 Dean Ornish: The world now eats, lives and dies like [people] in the U.S.
Dr. Ornish's talk is at its best when he highlights the growing obesity problem using the US map. This kind of visual makes people sit up in their chairs and go "wow, this really is a growing problem!" Then the next image of the "devolution of humans" really hits home. The graphic makes people laugh, but they also get the seriousness of the problem (Sometimes you have to laugh to keep from crying). 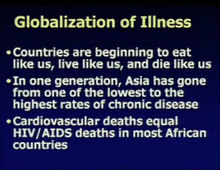 The audience got the doctor's message: (1) Diet and life-style are the leading cause of many cardiovascular diseases, (2) the problem in the US is getting worse not better,(3) the problem is spreading to other parts of the world as they abandon traditional diets, (4) an "Asian diet" is best for preventing many kinds of diseases, yet (5) other parts of the world are becoming as unhealthy as Americans. Watch his talk below or on the TED site here. 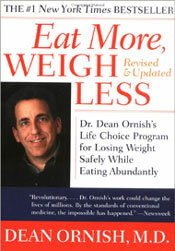 Dr. Ornish is the author of several health books like this one. The presentation would have been even better if the bullets were broken into several different visuals. It takes no more time to have three different visuals (slides) appear in order than it does to display a single slide with three bullet points. You can easily imagine how the two slides above could be visually represented better in, say, six simple (and visual) slides that augmented the doctor's spoken word. The doctor clearly got his message across while illustrating his point visually with these simple graphics. If you happen to be in the Osaka area (which I realize is not many of you), I'd love to see you at my presentations in the Apple Store February 9 (and again on February 25). They both start at 7:00pm, and are free, of course. 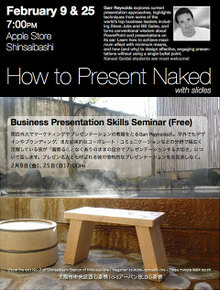 The presentations are called "How to Present Naked (with slides)". The presentations are in English. Below you can see two posters for the events in the form of smaller jpegs. The black one below (left) is the large poster that appears at the entrance of the Apple store. The other poster (right) is one I made myself in iWork (Pages) in just a few minutes. This poster was printed and placed around campus. 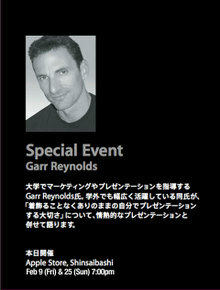 I often do presentations in Apple Stores in Japan (Tokyo, Nagoya, etc.). Perhaps this summer I'll do some Apple Store presentations in other parts of the world as well. It would be great to meet some of you at an Apple Store in New York or London or Toronto, etc. in future. The February 9 presentation had a very good feeling about it. Great audience. 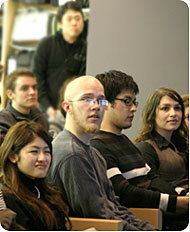 The audience was a good mix of business people, designers, professors, and college students from all over the world. We should have recorded it. We stayed nearly an hour answering questions and greeting people before finally heading to the local pub for a pint on the way home. One PZ reader even came all the way from Tokyo (about three hours by expensive bullet train) just for the presentation — thanks Jeonghoon! There is no video but you can see pics from the presentation here, and you can get the gist of the talk from this 5-page handout (750k pdf). Software developer Hiroyuki Shinohara gave his thoughts on the presentation on his blog (in Japanese). There were no chairs available when he arrived so Hiroyuki graciously agreed to take a seat on the floor near the front. Quite cozy; all we needed was a fireplace. Hope to meet many more PZ readers at my next public talk held at the Apple Store February 25 (Sun) at 7:00pm. See you then! "The rub comes from the music Apple sells on its online iTunes Store. Since Apple does not own or control any music itself, it must license the rights to distribute music from others, primarily the “big four” music companies: Universal, Sony BMG, Warner and EMI.... When Apple approached these companies to license their music to distribute legally over the Internet, they were extremely cautious and required Apple to protect their music from being illegally copied. 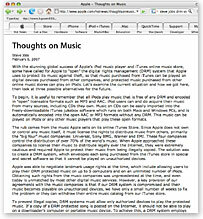 "If the big four music companies would license Apple their music without the requirement that it be protected with a DRM, we would switch to selling only DRM-free music on our iTunes store. Every iPod ever made will play this DRM-free music." Back in 2002, when I still was working in Cupertino, I remember that Jobs had publicly grumbled a bit about the record companies and their reluctance to loosen up. "If you legally acquire music, you need to have the right to manage it on all other devices that you own." Here's an article called The Big DRM Mistake in The Register from last year. People have been unhappy about DRM and iTunes for quite some time. You may remember the Anti-iTunes/DRM demonstrations at the Apple retail stores last year. Has Apple changed its tune? Apple seems to be saying that it is indeed DRM itself that is the problem. Interesting to see where this goes. While working on my proposal for the Presentation Zen book this weekend I spent some time going through all the archives of the PZ site. I came across this post I wrote back in September, 2005 on finding design inspiration from ads inside Japanese commuter trains. 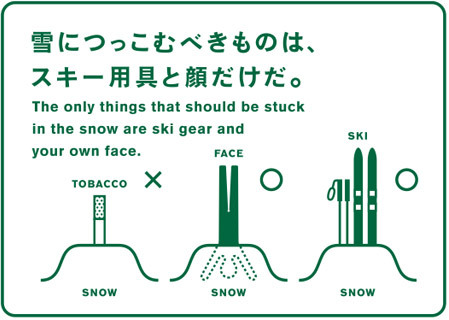 The posters from Japan Tobacco on the "Smokers' Style" campaign are still a very interesting example of mixing text, simple graphics and simple color to get a message across in a sea of clutter. Take some time to go through the posters. You can see each poster in a larger size here and even get a pdf version of each poster. See many more posters from the series here. I love the posters in a weird sort of way which I can't quite explain, and they were remarkable while they were displayed in public over a year ago. However, I don't think they did anything at all to improve the habits/manners of smokers in Japan. NOTE: The "Smokers' Style" campaign was not an anti-smoking campaign; it was a "manners" campaign sponsored by (ahem) Japan Tobacco. If you are interested in the anti-smoking movement in Japan (such as it is), there is some info in English here. In 2002 the Health Promotion Law (Article 25) was enacted to protect people (employees and customers, etc.) from passive smoke in public buildings, restaurants, etc. The problem is establishments currently only have the "duty to endeavor to take necessary measures to protect users." Much more info about the Health Promotion Law and the protection of non-smokers in Japan here, and here in Japanese.